It seemed that I had quite a few eyeballs on my first day of hairdressing post so I figured I will definitely continue with them every now and again when I have something fun to show you. I'll start off with with week two (last week) we were shown conditioning treatments used for the hair and oil treatments for the scalp. 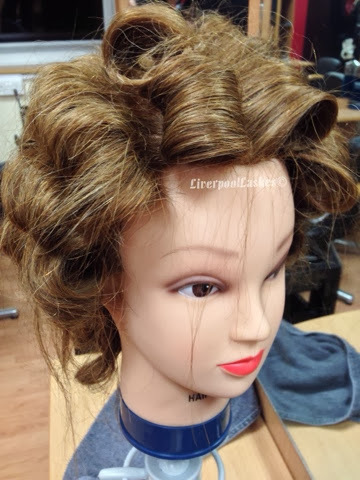 Although this is a valid and useful service in a salon, it is taught so that we can practise how to neatly section the hair and will help us learn the correct process to colour hair further along in the course. Believe me when I say that sectioning hair seems alot easier in theory than it is in reality!! You take the tail of a comb and depending on how you hold it can make the difference of a nice straight line or a crazy wave. Above is the 'hot cross bun' sectioning that we have been taught to do. I've only done this a handful of times so it's not perfect here but I wanted to show you what I meant. It basically ear to ear and then straight down the middle. For the conditioning treatments you work in sections within each quarter to apply the product and then massage in. Moving onto Monday's lesson which was curly blows. Now despite my Liverpudlian upbringing I've never actually had or done a curly blow before. That being said it also meant that I had absolutely no idea what one is meant to look like in the end either. I watched a You Tube video on it (good old You Tube!) and then we had our lesson. At this point I was still getting to grips with the hairdryer/brush combo so it was an added challenge that I was totally up for. Once you've sectioned the hair (it's slightly different than above for blowdrying and curly blows) it's time to get down to business with the most amount of brushes you can get your mitts on. As we don't have a massive resource of brushes we have been taught to work with two or three, leave the brush in and then when you run out we remove the brush, pick the curl up and pin it. As you can see the pinned curls aren't perfect, this was my first attempt ever after all. The problem I found is as you start at the bottom moving in rows, I would often get the bristles of my brush caught in the pinned section below. 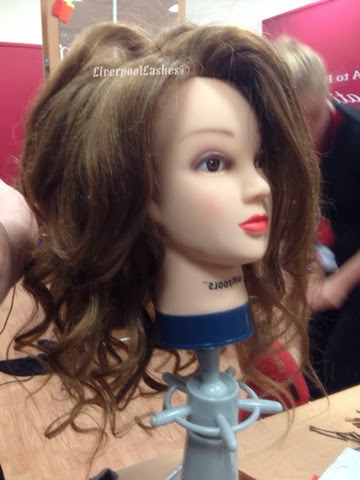 Megan's hair (the mannequin's nickname) is awful. 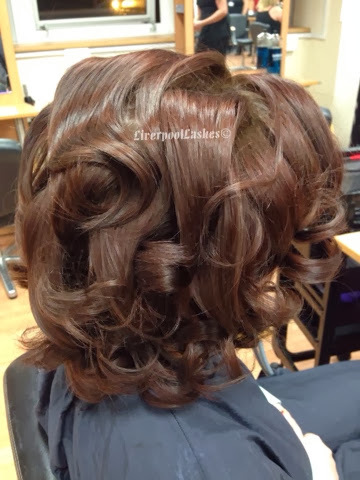 Although it's human hair so it can take heat etc, no amount of treatments or blow drying can make it great. 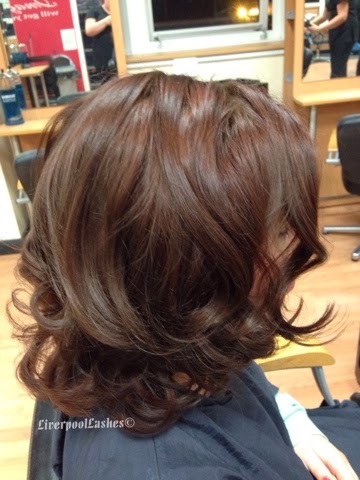 Here's how Megan's curly blow turned out. I was actually pretty happy with it. 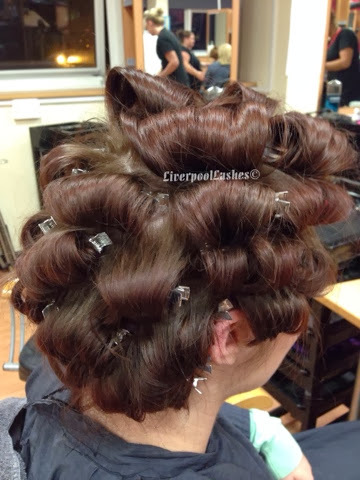 Once you've taken the pins out it is a little difficult to try and lose the look of the sections but hold the curl. The tutor said that I'd done a really good job of it and didn't seem to correct me on anything I was doing so that was good. 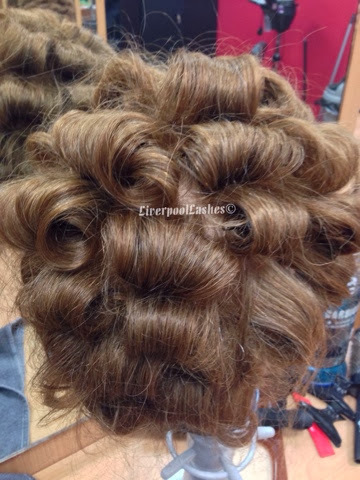 Onto my first 'human' head curly blow that I did last night. I had not had a chance to practise in between so this was only my second attempt ever. Luckily I had drafted in a very patient friend of mine and removed the pressure off my shoulders by telling myself she washes her hair every morning so this can be amended within a matter of hours if she was really unhappy with it. 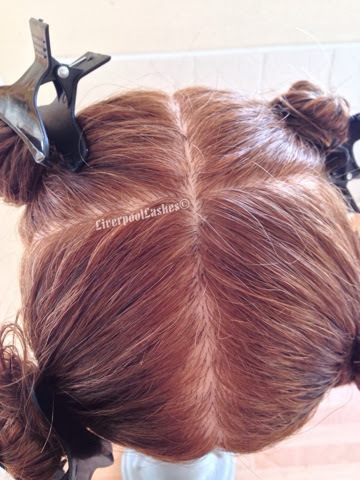 The photo above is Ali's hair fresh out of the pins, literally just as her hair fell by taking each one out, I love the look of it and more importantly, she did too. Here is her hair after a little dressing. The lesson I need to learn from this attempt is to try to allow a good amount of time for the pins at the top to really cool down. In this lesson I felt like I was rushed a little by the tutor despite me finishing quite a lot faster than others around me, this meant that after this photo was taken it started to drop further than I would have liked. I hope you've enjoyed reading this post today. 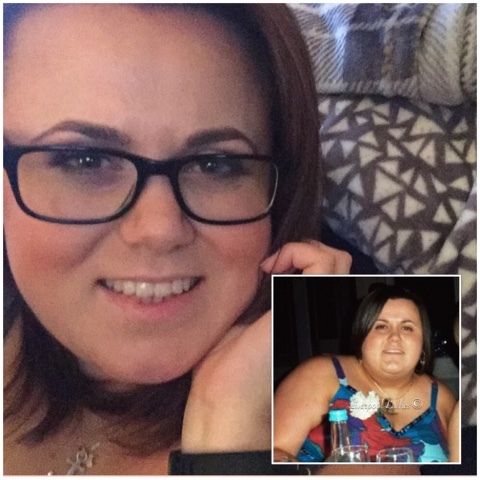 I love sharing my experiences with those of you who are interested. This looks beautiful, well done!